During the 19th century, a French mathematician who was renowned for his studies developed a system for winning at roulette. His name was Jean-Baptiste le Rond d’Alembert and the strategy that he developed is called the d’Alembert roulette in his honor. If you’re familiar with the popular Labouchere Roulette system, you’ll see that this method of betting on roulette is rather similar in that you increase the size of your wager when you lose and decrease the size of your wager when you win; however, this strategy is less aggressive. You may have seen somewhere that the d’Alembert roulette method was based on a faulty line of reasoning regarding the probability of flipping a coin. While it’s true that the principle that he founded the system on was proven to be false, it is still possible to successfully use the d’Alembert roulette system to win over the roulette. Before you begin to use the d’Alembert roulette system at the table, one of the best tips, is to come to a decision about how much you are willing to bet. You can determine your minimum bet by using the table minimum and then set a maximum that you are comfortable with. You want to ensure that your bet is very small compared to the maximum allowable table bet. Whatever you decide to make your bet, it will become one unit. For the sake of this example, we will use $10 as the unit. To get the best results from the d’Alembert roulette system, you should place your wagers only on the outside even bets, which include odds, evens, reds and blacks. Place a one unit bet. In our example, our bet is $10. If you win, you will just repeat the first step again. If you lose, you will move on to step two. Increase your bet by one unit. In this example, your new bet would be $20. If you lose, you will go on to step 3. Increase your bet by one unit. In this example, you would now be betting $30. If you win, you would decrease your bet to the amount you wagered in step 2. If you lose, you would continue to step 4. Increase your bet by one unit. In this example, you would be betting $40. If you win, you would decrease your bet to the amount you wagered in step 3. If you lost, you would increase your bet by one unit and continue to play. If you’re playing with the true d’Alembert roulette system, you would continue to increase your bet until you reached the table maximum; however, many people will choose a lower maximum limit that they feel comfortable with and stay at that limit. The biggest benefit of the d’Alembert roulette system is that it allows you to progressively become more aggressive with your betting without doubling your bet every time that you lose. As a result, you’re much less likely to lose a large amount of money. 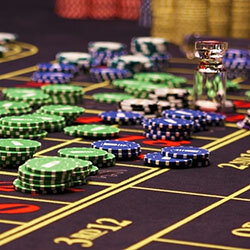 By comparison, losing seven times with the Labouchere Roulette system would mean a loss of 123 units, while losing the same amount of times with the d’Alembert roulette system means only losing 28 units. The driving concept of the d’Alembert roulette system is that you can make back losses over the course of a number of spins rather than trying to double your money. If you hit a winning streak, you will be able to still make a large amount of money without having as much risk. This separates the d’Alembert roulette system from other roulette systems that have very slow progressions and limited profitability as a result. Earlier in the article, we touched on the fact that this roulette system was founded on a principle that was incorrect. The d’Alembert roulette system assumes that the odds of winning on the roulette wheel increases the longer that you play as if the wheel had some sort of memory and would eventually allow you to win. The truth of the matter is that you have the same odds of winning each time the wheel is spun. There is no guarantee that it will ever land on black or red, on high or low or on even or odd. As a result, you’re never assured a win with the d’Alembert roulette system the way that its inventor originally believed. The other problem with the d’Alembert roulette system is that it is possible for losses to accumulate if you hit a big losing streak. Because you do not increase the size of your bet dramatically when you lose and decrease it when you win, you may never be able to recoup losses that are continuous over a long period of time. In closing, the d’Alembert roulette system is a nice alternative to the Fibonacci Roulette system for those who are less tolerant to risk but still want the opportunity to make a profit when playing. Check out the Reverse d’Alembert roulette system as well!